At LAX, Lufthansa operates from the Tom Bradley International Terminal (TBIT). The check-in counters are located in zone C and open 3 hours prior to departure. I arrived a few minutes after the counters opened and had my bags checked and boarding pass in hand within 10 minutes. Lufthansa uses the Star Alliance Lounge for their premium cabin and Star Alliance Gold passengers. The Star Alliance Lounge is a fantastic lounge and offers an elegant and comfortable space for passengers to relax, refuel and recharge before a flight. 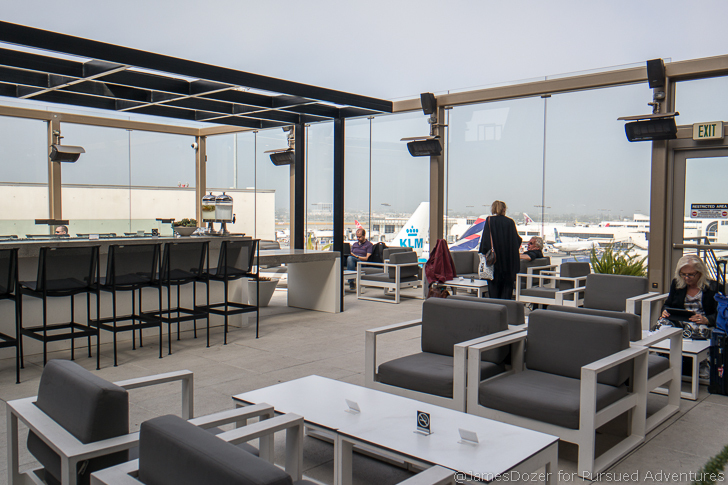 With quality food and beverage options, refreshing outdoor spaces and a balcony deck overlooking the departure terminal, the Star Alliance Lounge at LAX is one of my favorite lounges in the entire Star Alliance network. 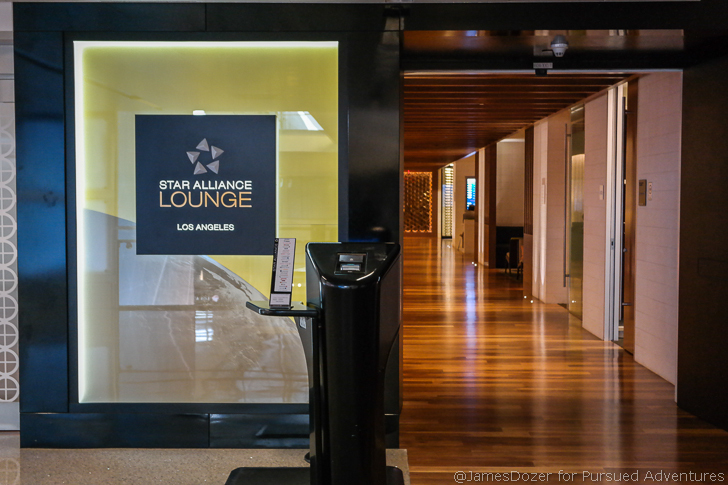 You can read my full review of the Star Alliance Lounge LAX here. I left the lounge a few minutes prior to boarding time and made my way to gate 152. Boarding had not been called yet but gate agents were already helping people line up into their respective lanes. I quickly snapped a few pictures of the beautiful bird and got in line with the other business class/Star Alliance Gold passengers. Boarding began at approximately 2:30 PM for our 3:10 PM flight. Lufthansa now utilizes biometric scanners at LAX. To be honest, I have no idea how these things work but they are really efficient. You don’t scan your boarding pass or present your passport to anyone anymore. You just walk up to the machine; get your picture taken and then you walk through to the aircraft. That’s it. Amazing huh? This Lufthansa Airbus A340-600 was configured with 213 standard, economy class seats in a 2-4-2 layout. In terms of passenger comfort, I think this is the best long-haul aircraft for economy class passengers. Note: Lufthansa charges $35 – $40 for advance seat selections. I was cheap and didn’t pay for it. Instead, I just selected my seats at check-in (23 hours before departure) for free and got acceptable seats on both my outbound and return flights. Unless you are traveling with others or have a specific seat in mind, I’d say save your money and select your seats at check-in. Just make sure to do it right at the 23-hour mark. On this flight, I was seated in seat 51A, a window seat located on the left side of the plane. Waiting at my seat were a pillow and blanket. Flight attendants later came by with cheap plastic headphones for those who needed them. These economy class seats measured 17.3 inches in width and provided 31 inches of pitch. Each seat was equipped with a personal in-flight entertainment system, USB port, overhead reading lamp, coat hook and electrical outlet (1 per 2 seats). Entertainment-wise, the Lufthansa World entertainment system was loaded with a decent selection of new movies, TV shows, video games and musical entertainment. Additionally, you can watch live TV (CNN, Euro news, and sports) or zone out with the flight map. The entertainment provided wasn’t the most robust collection but it was definitely enough to keep you entertained (if you haven’t been the movies in a few months). WiFi was provided on this flight and it was decently priced. I didn’t pay for it but 17 euros for a full-intercontinental flight is a good deal. Storage-wise, these seats were pretty weak. The seatback pockets were only large enough to hold smaller personal items such as eyeglasses, passports, cell phones and other small tablets. As the final passengers were boarded, the Captain came on the PA to make his announcements. He welcomed us onboard and provided us with our estimated flight path and time. We then pushed back from the gate and made our way to runway 24L for our 10 hours and 30 minutes flight to Frankfurt. Taking off from LAX is always a joy to see from the window seat. Once we reached our cruising altitude, nothing happened. The seatbelt signs stayed on and the flight attendants got up to do something. I assumed they were preparing for our first meal service but after some time, I began to wonder what they were actually doing. We all sat there with our seatbelts on until one by one, people started to ignore the signs and got up to use the lavatory. I was surprised by how long the seatbelt signs stayed on and how long it took for the meal service to begin. About an hour into the flight, the flight attendants finally came by with a beverage service. Drinks were accompanied with a package of saltine crackers. About two hours into the flight, dinner was served. As the trolley came down the aisle, the flights attendant asked if we preferred a chicken or pasta dish. No menu cards were handed out and no further description of the menu was provided. Wanting some protein, I went with the chicken dish. The chicken was served with rice and carrots, along with a side salad, bread roll, cheese/crackers and an orange cake dessert. I criticize Lufthansa’s catering all the time but I have to admit, this meal was surprisingly good. The chicken was cooked perfectly and the seasoning was on point. It tasted a lot better than it looked. The meal itself was tasty but this was the slowest meal service I have ever experienced on a flight. The service wasn’t bad; it was just slow to start and slow to end. I felt like it was almost three hours into the flight by the time everything was said and done. I understand this is a “daytime” flight but it baffles me why/how the meal service was so slow. After a quick pass of the duty-free cart, the cabin lights were dimmed and the window shades were asked to be lowered. I got up to use the lavatory in case my seatmate decided to fall asleep. Unique to the Airbus A340s is the location of the economy class lavatories. Unlike other aircraft where the lavatories are located to the rear of the aircraft, the A340 economy class lavatories are located downstairs, in between the two economy class cabins. The lavatories were not stocked with any amenities but were more spacious than standard-size lavatories found on other aircraft. Once I got back to my seat, I did a little bit of work on my laptop and then zoned out with a mindless action movie. Comfort-wise, these seats were not bad. The seat cushion was a little hard but everything else was pretty decent. The window seat offered additional shoulder/elbow room due to the curvature of the plane and the recline was pretty good too, offering approximately five inches of recline. That’s not bad for an economy class seat nowadays. In between meals, water, juices and some candy were available for self-service in the galleys. Service-wise, the flight attendants were very typical of Lufthansa. They were polite, but not overly friendly, and very mechanical. The meal service felt like an assembly line and they didn’t really walk the cabin much during flight. Breakfast was served approximately two hours outside of Frankfurt. There was only one option available and it was some sort of egg quiche thing. It was served with hash browns, a bread roll, and fruit cup. It wasn’t the best meal but then again, most airplane breakfasts aren’t. Overall, this was a decent flight experience with Lufthansa Economy Class. I’m not the biggest Lufthansa fan but I have to give them credit where credit is due. The seat had some negatives complaints (lack of storage, hard seat cushion, etc.) but the in-flight entertainment system and catering were better than expected and the window seats on these Airbus A340s provided a decent amount of personal space. Have you flown Lufthansa Economy Class lately? If so, please share your thoughts with us in the comments section below. Thanks for reading!